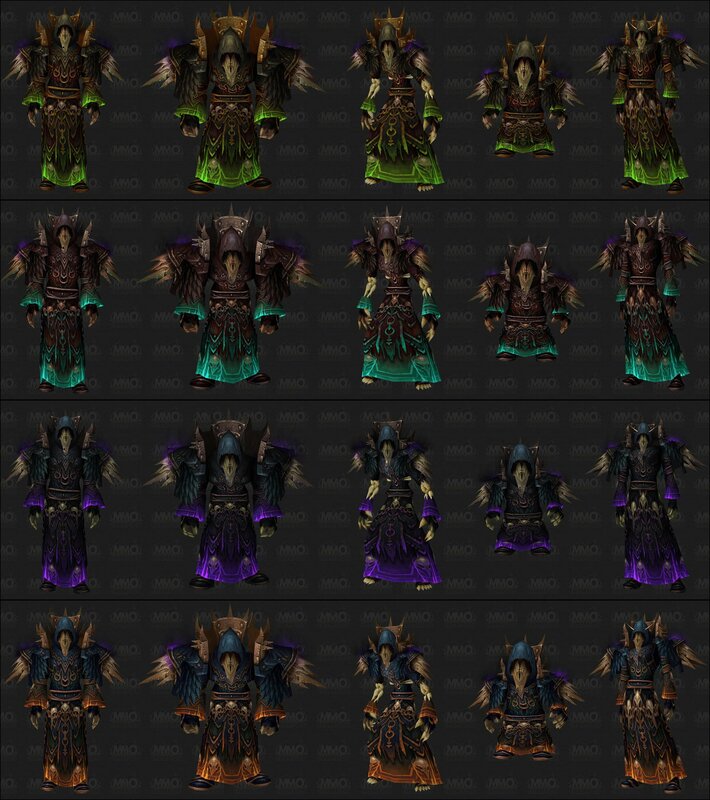 This set comes from Ulduar 25, Caveau d’Archavon 25, and Dalaran JP Vendors. Gantelets du conquérant indiscipliné from Mimiron's chest. How about the Bâton des péchés justifiés (A) / Bâton de la voie à gauche (H) from La reconnaissance des puissants (A) / La marque de la puissance (H), the warlock class quest in Donjon d’Ombrecroc? There are also Faux de guerre that rest on your back upside-down compared to the class quest reward, which rests rightside-up. Or the Faux de givre du seigneur Ahune from Ahune, which fits with the Northrend theme of the whole set (but you'll have to wait until next summer). Ever since the 5.0 patch, warlocks and mages can no longer buy JP and VP gear with spirit on it, making it impossible to obtain Echarpe des incantations puissantes. I made a ticket regarding this and awaiting a respone atm. 2h Staff: Ti'tahk, les Marches du temps Really fits well with this set in my opinion. Boots: Mules de salut forgées par les Titans, The purple color applies the finishing touch. Brassards de Gangrecœur Felheart T1 bracers. BoE so look in the AH or farm MC. Griffe du sage, Croc de l'esprit, or Ouvre-faille all look great with this set imo and are easy to acquire. If you can get it Grand livre des rituels révoltants matches the ominous look very well. The Livre des morts and it's other variants work quite well with this set. It adds to the "Dark Practitioner"/"Necromancer" feel. Thought I'd say that Faux de flammes de Fandral goes fairly well with this set, but that's just my opinion. I'm shocked that Bâton des mystères infinis hasn't been mentioned as an excellent match for this set. Magelame du gladiateur dramatique and Sorcelame affligée look great. Staff, Bâton d'énergie du gladiateur dramatique. Edit: Heroic Dague de la radiance flamboyante is an awesome dagger for this set. For a staff, I prefer Malice, which is a very stunning addition to the set, and very "warlocky". Chemise de travailleur rouge covers up the visible neck area perfectly, making the outfit seamless.